The highly versatile Kinergy Driven Spiral Elevator, featuring the patented Kinergy Drive System, is an inclined Vibrating Conveyor “wrapped around a pole”. Material handling functions such as lifting, lowering, heating, cooling, screening, or deliquefying can be achieved with a Kinergy Spiral Elevator. Its compact design and long length conveying trough are ideal when heat transfer applications need to be accomplished in a small area. Kinergy Spiral Elevators consume less power, require minimal maintenance, operate quietly, and have an adjustable stroke and frequency. All of these features combine to ensure the best performance level. The simple design of the Kinergy Drive System, coupled with the best performance rating, makes the Kinergy Vibrating Spiral Elevator an excellent choice when it’s needed. Durability: Kinergy Vibrating Spiral Elevators are built to last with an average of 20 or more years of productive use. Proven Design: With its simple design and highest performance rating, Kinergy’s Spiral Elevators are the best choice when lifting or lowering bulk solids. All units are inherently counterbalanced which eliminates heavy foundations or support structures. Energy Efficiency: All the Vibrating Spiral Elevators utilize the Kinergy Drive System, which is the most versatile and energy efficient drive available. This drive is a combination of a free force input from an A.C. type electric motor with the output of sub-resonant tuned springs. When the applied load increases, the springs inherently drive harder. It maximizes the use of “Kinergy” which is defined as the kinetic energy developed by a spring’s motion during the drive portion of its cycle. Dust-Tight Construction: Kinergy Vibrating Spiral Elevators can be made with dust-tight covers that will minimize or avoid dust emissions. Integral dust tight covers mean there is no need for expensive dust collection systems. Versatile Applications: Kinergy Vibrating Spiral Elevators are inherently self-cleaning which makes them desirable for sanitary applications or when material contamination is to be minimized or avoided. This is essential in the food, pharmaceutical, cosmetic, or munition industries. Adaptable Drive Configurations: The vibratory drive system can be located at the top or bottom of the Spiral Elevator. However, “bottom” located drive units are preferred because they lend to a more simple support. Standard Dimensions: Kinergy Spiral Elevators are compact and can provide long conveying lengths in a very small amount of space. Lift heights to 35’-0” are available in standard designs. The Spiral Elevator can accomplish heat transfer functions when only a small space is available. Simple Electrical Control: Kinergy’s innovative technology improves performance. 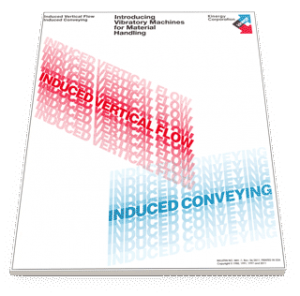 The operating stroke and frequency of a Kinergy Vibrating Spiral Elevator can be automatically and repetitively “pulsed” to minimize adhesion to the conveying trough or to provide flexibility needed for heat transfer retention times. Reduced Sound Levels: Reduced sound levels are another benefit of Kinergy Vibrating Spiral Elevators. Typically, Spiral Elevators operate less than 80 dBA in the loaded condition. Compatibility: Most of the component parts of the Kinergy Vibrating Spiral Elevator are interchangeable with other Kinergy Driven units even though their functions may differ. These common components extend to Kinergy’s Vibrating Feeders, Conveyors, Screens, Fluid Bed Coolers and Dryers, and various types of Foundry units. This reduces the number of spare parts required in inventory. Learn more about which bulk solid materials can be applied to Kinergy Vibratory Machines. The patented Kinergy Drive System has proven to be the most versatile and energy efficient vibratory drive known when applied to Induced Conveying machines. This makes Kinergy Vibrating Spiral Elevators the optimal choice. To learn more about these innovative machines, please contact Kinergy at 502.366.5685 or download Kinergy’s descriptive Bulletin KDC-1 entitled “Kinergy Driven Vibrating Conveyors”.